Ask fellow campers about "Havasu Falls RV Resort" and nearby attractions. Modern, clean rv park with good hookups, level concrete pads and nice facilities. Designed for big rigs. 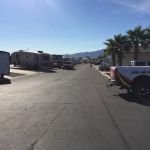 Absolutely no junk or old units like you find in most rv parks in Lake Havasu. No green space or landscaping, no shade. Sites are narrow with no privacy but roads are wide & paved. We had good cable tv, and WiFi worked well. It is a few miles out of town so you really cannot walk to anything. We camped at Havasu Falls RV Resort in a Motorhome. This is a large campground. Basically a parking lot with rv spaces. The sites were level and easy to maneuver. Our spot was near the restrooms/clubhouse. Spouse used the shower facilities and mentioned the water was not very hot. They did have a nice clubhouse with an exercise room. The swimming pool was open, but we did not use. Also, the only place to dump our trash was at the dumpster as we exited the park. This rv park no longer accepts the Passport America discount. Clerk told me they were under new management. No cable TV available. Plenty of over the air channels. It was quiet at night - did not hear any road noise. We camped at Havasu Falls RV Resort in a Motorhome. If traveling to Lake Havasu City I would recommend traveling from the north (I-40). We came up from I-10 (very windy roads/2 lane most of the trip). Easier to access from the north plus there is a Pilot Travel Center on I-40/AZ 95 highway. Sites are a little narrow but with concrete pads that are level surrounded by gravel. It was pretty hot while we were there, so we didn't spend any time outside anyway. We have stayed here three times and will do so when we come through here next time. We camped at Havasu Falls RV Resort in a Motorhome. This is a beautifully maintained RV park. I was impressed that although the whole park was on a slope, the paved sites were terraced so they were all level. For the price I would expect the sites to be a bit more roomy. We camped at Havasu Falls RV Resort in a Fifth Wheel. This is a tourist area so there's tons of things to do. ATV and boat rentals seem to be big in the area. This park is a parking lot. The roads are all blacktop, parking spaces are cement pads and "patios" are crushed rock (not comfortable to walk on). They all have a picnic table but the spaces are very close together so sitting outside was like sitting in an alley between buildings. We were not able to open our awning as it would have hit the rig next to us. There are NO discounts and NO cable here (we got CBS & several FOX stations with our antenna). The dog walk areas are better than most but with all the blacktop, our dog was hopping all over on the way to & from. There are a LOT of rules and many warnings that if you do not follow the rules you will be evicted without refund and future reservations cancelled. The up side was that the space was level and the laundry room is very nice (although there is a LIMIT of 2 machines per person). With all the paving I suspect this would be a VERY hot place when the temperature gets very high. We camped at Havasu Falls RV Resort in a Motorhome. Stayed here for a few days. Sites are clean, level, and paved but tight. Nice pool and rec. hall but not a lot of activities. Great place to stay short term but you need to find things to do on your own. We camped at Havasu Falls RV Resort in a Travel Trailer. Shopping and amenities close by. Great access to the London Bridge and parks. Nice park with many easy pull-thrus and convenient to local attractions. It is basically a large parking lot but very well organized with level sites. The site width was narrow but adequete. Not cozy to sit outside your rig without any landscaping between sites. But they have a very nice patio for happy hour which overlooks the valley and Colorado river in the distance. Breathtaking sunsets. We would return again. We camped at Havasu Falls RV Resort in a Fifth Wheel. We enjoyed sitting by Lake Havasu on the beach at the Rotary Community Park (free) to stare at the water, watch the boats and go for walks on the boardwalk. Almost an ocean feel without the humidity. We stayed in this park for 5 days. It was a little pricey but that is the going rate to stay in Lake Havasu. The sites were clean with concrete pull-throughs and gravel in between. They were a bit tight. The staff and the park people were pleasant. They had a nice dog walk down the one side of the park. We were here to see Lake Havasu and the London Bridge so we didn't get to use the amenities. We visited Lake Havasu City downtown and lucked out. There was a meeting of the "Duece Coup Club" over 100 antique and vintage cars. Seems there is always something going on in Lake Havasu. We camped at Havasu Falls RV Resort in a Motorhome. Plenty of shopping including a new Outlet Mall. Some unique stores in Downtown Lake Havasu. We are staying here for just two nights. When we checked in, we were given quite a list of rules. Of those, one was 'no scooters', another was 'no car washing or repair at site' and quiet hours are 10-7. Okay, fine. Within minutes of getting set up, 2 kids went barreling past our site riding scooters. Now, it is 10:40 PM. A person in the rig next to use (right outside our bedroom window) has a very bright repair light on and appears to be working on his rig. There is also a group of people laughing and talking loudly right behind us. Why, oh why do parks have all these rules and enforce none?? We have been driving all day but won't be getting much rest tonight. The park appears well maintained but the sites are very close and we are very disappointed. We camped at Havasu Falls RV Resort in a Fifth Wheel. Lake Havasu is a nice area but look for another park if you would like a quiet evening. A very nice, clean park right on Hwy 95. Rig parks on concrete and yard is gravel. Sites are close but we had no one near us because it is off season. Passport America is only good for one night off season. We have stayed here before and pool and clubhouse are lovely. Pull- thrus are short but they put a cone behind our car. We camped at Havasu Falls RV Resort in a Motorhome. Good shopping close by in car, or large parking lots for RV. We stayed for a month. Denise in the office is great! Concrete pad, good wifi and utilies. Shopping close by. We camped at Havasu Falls RV Resort in a Motorhome. London Bridge close. Angelinas Restaurant was very good. Rotary community Park nearby. Beautiful place. Lots of benches to sit by the water, picnic tables, beautiful sunsets. Rate is based on the weekly rate of $250 plus tax plus $2 per day for dog. This is a very clean, very quiet and neat park about 4-miles north of the London Bridge on Arizona 95 (west side of road). There are 4-rows of sites...the 2-middle rows are pull thru and the others are back in. One row each of pull-thru and back-in face NE while the others face south and SW. The owners told us the pull thru's are 50' which seems about right as we had to disconnect as both the MH and Jeep would not fit on the pad. Even disconnected the Jeep would not fit on the pad. The pads are level and the site includes a picnic table, 30/50 electric, water and sewer. There may be a cable connection but as we have satellite I didn't check. We had a clear view of the sky for the sat. dish. There is a small pool, nice laundry room and a game/activity room. 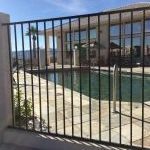 Owner's are friendly and there appears to be on-site security. About the only negative we have about this park is the spacing between sites...very close quarters. The RV is parked on a concrete pad and your toad/towed vehicle is parked on a gravel area between your pad and the pad next to you. The park was about half-empty when we arrived and despite a lot of empty sites new arrivals were parked around us rather than being spaced out throughout the park. All sites have a nice view of the mountains and some have a view of a portion of the lake. Despite the close quarters we would stay here again. We camped at Havasu Falls RV Resort in a Motorhome. WalMart, Penneys, Sears Lowes, Home Depot, a Jeep/Dodge dealer, a 10-screen movie theatre is between 1/4 and 2-miles north of the park. A really nice RV park. Everything is clean and up-to-date. The wifi is strong. The cable TV is great. Nice view from some sites. Easy access sites. The only "minor" negatives are that it is basically a blacktop parking lot with a few trees and the price. But the blacktop is what makes it all so clean. You get what you pay for and I would definitely stay here again. We camped at Havasu Falls RV Resort in a Travel Trailer. One of the nicest parks our group has stayed in. They recently changed the management team and Denise is terrific!!!!!!! Our group prefers pull-thru sites and they were able to accommodate us with some very nice sites. Only one rig needed to use a safety cone (offered by Denise) for their 36' RV with a 20' trailer. As this is still snowbird season, they had many activities going on. Nice rec room. Heated pool. There is a $2.00 charge per day for a dog. We camped at Havasu Falls RV Resort in a Motorhome. For the area this is a clean, modern well run park. Sites are pretty level but a bit narrow. Power,cable & wifi were all strong. It's right off the hiway but very little road noise. Very hard to cross hiway 95 at times... Traffic! We will stay here again. We camped at Havasu Falls RV Resort in a Motorhome. Lots of Off highway Vehicle trails to ride out of the park in the surrounding foothills and washes. Much to see and enjoy at Lake Havasu City. The London Bridge is there and lots of things to see and do. London Bridge is the main attraction in town, but it is a clean, well kept city with good shopping. 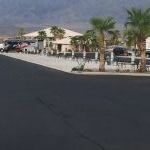 Are you affiliated with Havasu Falls RV Resort ?